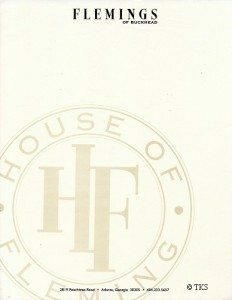 Started in 1980 House of Fleming has established itself as one of the premier manufacturers of exotic skin products in the world. From alligator belts with precious metal buckles to alligator handbags, wallets, picture frames, card cases, and note pads, golf bags to Harley Motocycle seats…you name it and they have hand made it at their factory in Atlanta, Georgia. When the shop needed to grow from the original rustic leather fabrication shop to a refined “jewelry” store of sorts, the owner contacted MSTSD and Cindy Trimble was the project designer. The clients direction was to create a store that was unlike any stores in the world selling similar products. Cindy traveled with her client to New York and Milan studying other retail shops taking note of all aspects of each store: what worked, what didn’t work, finishes, lighthing, product display and even their staff. The design process was all emcompassing requiring a total reimaging of the store, the graphic identity and even the store owner. With her team at MSTSD, Cindy created a modern, refined lodge interior that showcased each individual product line the shop sold so that it was clearly displayed for customers to see, but protected from their handling and damaging any of the skins. She custom designed a signature carpet which came from a photograph of an aligator’s belly. 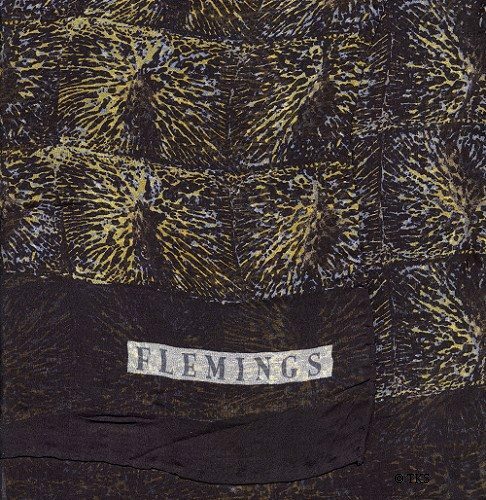 While in Italy, she designed a signature silk scarf that was given to Fleming’s customers. Every detail was carefully thoughtout in the 900 square foot boutique. 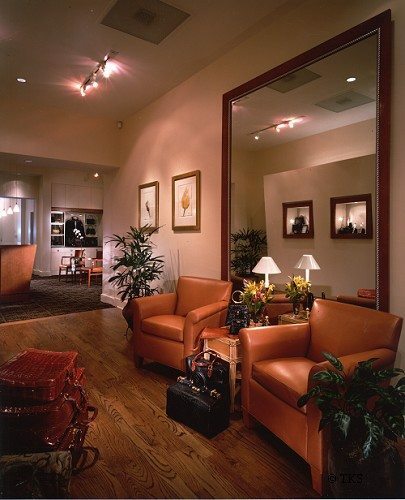 The redesign of the boutique catapulted the owners into a new level of sales and international exposure. 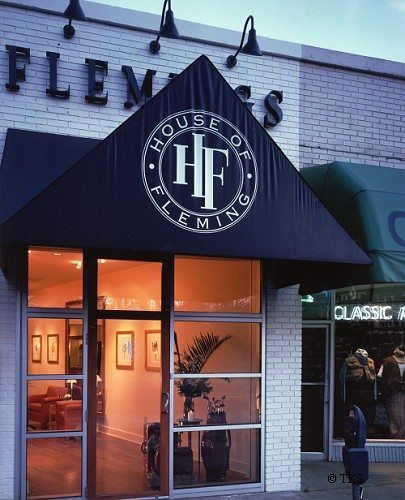 Flemings continues to provide luxury leather products to customers across the globe. 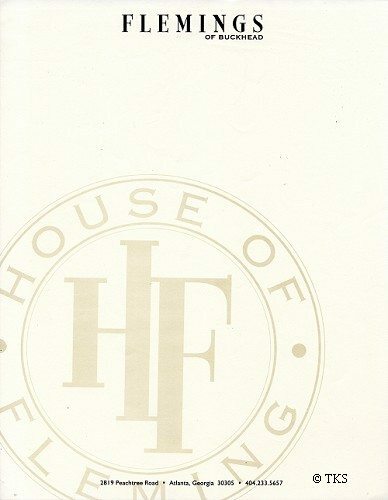 And after 13 years of being in their signature boutique the retail space continues to sparkle and showcase their products and has supported their international reputation, an alliance with the PGA tour and continued sales in their unique market. 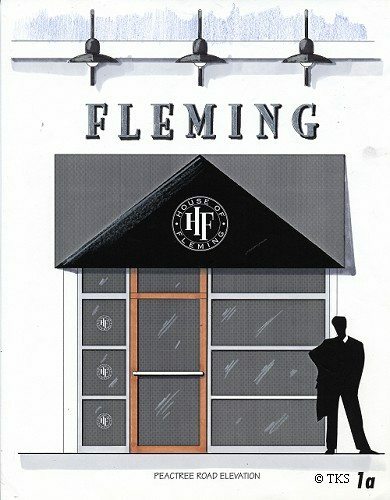 Conceptual Drawing by Cindy Trimble for Front Facade Design including the awning design, signage and lighting design. Main Showroom area where Alligator products other than belts were displayed. Locked storage is concealed under the display fixtures. 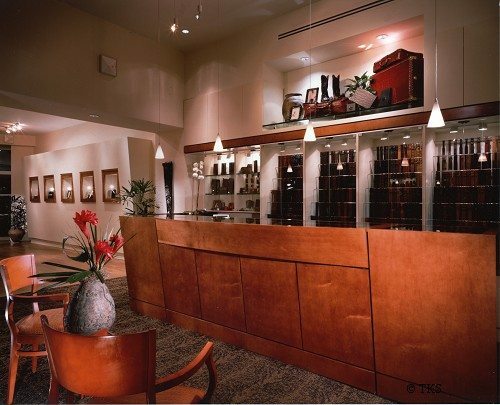 Custom Belt and “Buckle Bar” where customers can select the leather that is hanging on the back wall and their silver or gold buckle that is displayed inside the bar cabinet under glass. This design feature was essential so that customers could not handle the expensive leather and damage it with hand oil or dirt. 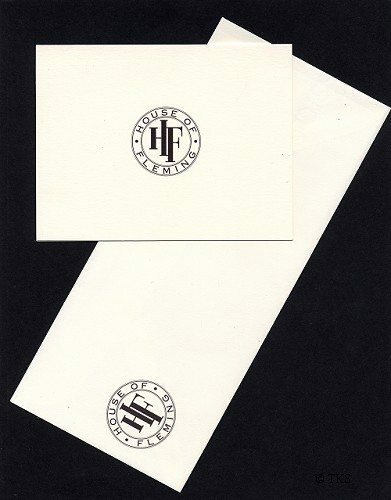 Cindy also assisted with the selection of the final name of the shop and designed the logo, stationary, signage and other marketing materials. Custom Silk Scarf Cindy designed in Italy for the shop to sell. The design was a stylized print of the alligator scales. 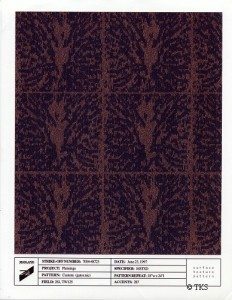 Custom Carpet that was also from the stylized print of the alligator scales. This was manufactured for the shop by Masland Carpets.